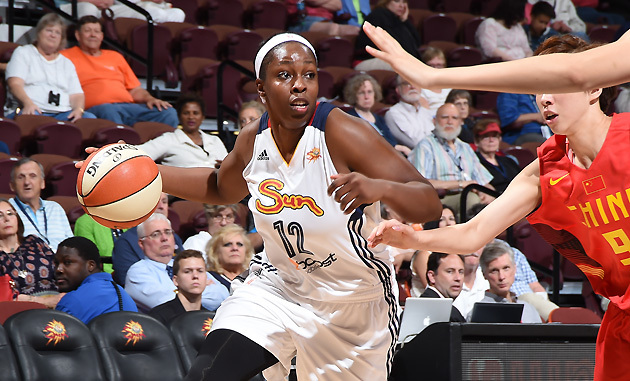 Chelsea Gray overcomes multiple knee injuries to become a standout rookie for the Connecticut Sun. Chelsea Gray’s first season in the WNBA is a dramatic reversal of fortune. The 22-year-old rookie point guard is now one of the top subs off the bench for the Connecticut Sun, and is averaging 7.4 points in 16.4 minutes per game just past the halfway point of the WNBA regular season. Gray ranked ninth in the league and first among rookies in three-point field goal percentage (38.9) through her first 15 games, and is one of the WNBA’s most promising offensive weapons. But the trajectory of Gray’s basketball career was drastically altered 18 months ago. Gray, a two-time All-America point guard, was in the midst of her junior year and one of the best individual seasons in Duke's history, when this harrowed date was forever embedded into her memory. With 8:07 left in the first half of a regular-season game against Wake Forest at Cameron Indoor Stadium, the 5’11’’ star went up for a rebound and came down with a dislocated right kneecap. Gray missed the remainder of Duke’s season and watched from the sideline as her team won the ACC Tournament and advanced deep into NCAAs, before eventually falling to Notre Dame in the Elite Eight. “That was the first time I had missed a significant amount of time and it was really tough on me,” Gray says. Despite her injury, Gray earned her second-straight All-America honors in 2013 and was named the ACC’s co-player of the year after averaging 12.6 points, 5.4 assists and 3.6 steals in 25 games. Fast forward 11 months, after intensive rehab and an optimistic recovery that enabled her to return to full-form for the first 16 games of her senior season, and Gray’s basketball career was once again halted by injury. In a midseason match-up against Boston College on Jan. 12, Gray got tripped up in the backcourt and heard something pop on the top of her repaired right knee. In an instant, she was lying on the floor of Cameron Indoor clutching her knee, just as she had done nearly one year before. But this time it was worse. This time her kneecap was fractured, her college career was over and she questioned whether or not she would ever play again. Gray finished her shortened career at Duke with 545 assists and 1,210 points, which rank second and 25th, respectively, in program history. After two knee surgeries in less than a year, a professional basketball career that once seemed inevitable appeared questionable for Gray and her WNBA suitors. “I don’t know that our people initially felt too optimistic about Chelsea with her injury history,” says third-year Sun head coach, Anne Donovan. But Gray’s talent was undeniable. Coach Donovan watched her compete at Duke when she was healthy, and knew that an injury-free Gray could change a game with both her on-court smarts and offensive capabilities. “There was no doubt in our minds about what kind of talent she could be in the league,” Donovan says. “We saw her intelligence when she played the game and knew how deceptive she was on the court.” Gray’s ability to get in the paint, handle contact and finish reminded Donovan of former-Sun and current Minnesota Lynx star point guard Lindsay Whalen. Donovan believes Gray’s defensive ability is the only variable that could prevent her from someday achieving elite status in the WNBA. “Where she needs to make adjustments to become one of the top players in the league is at the other end of the floor." With her average speed, Gray often struggles to close out opposing ball-handlers, and as a result, is susceptible to costing her team in the backcourt. While the future of Gray's WNBA career remains undetermined, the upside to her abilities is indisputable, along with the fact that she won't ever take a single game for granted. "I get happy just being able to put on the uniform again," Gray says. "I've learned to enjoy every moment on the court and just play as hard as I can while I have the chance to."